Ever wonder which OPI nail colors are the most popular. Well, here they are! 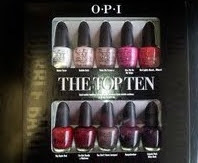 This fabulous mini collection is a limited edition holiday collection of OPI's most popular shades. It's seems a bit hard to find right now, though. Find this mini set at salons selling OPI products and amazon.com.